The Queensland & Northern Territory Chapter Conference 2019 will be held on Thursday 16 to Saturday 18 May 2019 at Sofitel Brisbane Central. Want more information about the Conference? Click here to visit our Conference Website. *To qualify for early bird pricing, please note that payment must be made in full prior to the close of early bird. If payment is not made by this time, the invoice will be adjusted to reflect the full conference price. Attendance at all sessions on the three days, morning tea, lunch, afternoon tea, Social Function and Annual Chapter Dinner. Attendance at all sessions on Thursday, afternoon tea and Social Function. Attendance at all sessions on Friday, morning tea, lunch, and afternoon tea. Attendance at all sessions on Saturday, morning tea, and lunch. Register early for your chance to WIN back your registration fee! 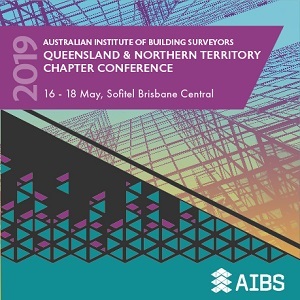 Register for the 2019 Queensland & Northern Territory Chapter Conference at the AIBS member full conference early bird rate before 19 April 2019 and automatically enter the draw to win back the full amount of your registration fee. The winner for the draw will be selected from all eligible registrations before midnight 19 April 2019, and will be notified by phone or email on 23 April 2019. If you're not an AIBS member, it's not too late to enter the draw to win! If you've been thinking about taking advantage of the benefits that come from joining as an AIBS member, now is the perfect time! Join as a full AIBS member and register for the 2019 Queensland & Northern Territory Chapter Conference before 19 April and still save over $100 off the full non-member conference rate. To find out more about why you should join AIBS or start the process to become a member, click here to be taken to our membership information. All registrations are for a single delegate for the entire conference or day, no individual session registrations accepted. CPD points will only be awarded to the registered delegate. Full conference registrations cannot be split for different delegates on different days. Day registrations cannot be split for different delegates on different sessions. Less than 7 days before the first day of the event - no refund. Any cancellation of registrations for conferences must be made in writing to confregistrations@aibs.com.au. A failure to make payment in accordance with the above terms will not be accepted as a valid cancellation. Please note that you must be signed in to see the correct pricing. The pricing that is offered to you below is dependent upon your AIBS membership status. If you feel the price that is shown for you below is incorrect, please contact the office on 1300 312 427 for help. You must answer all questions marked with an asterisk and click "Save Responses" in order to complete your registration and proceed to checkout. Please note that upon registration you will receive an automated order confirmation. For details on how to access your invoice or receipt, please refer to our help guide. Registrations are open until Friday 10 May unless capacity is reached prior to this date. Dates may appear in American format depending on you internet browser language settings. This event will be held on 16 to 18 May 2019. This conference is provided and hosted by the Australian Institute of Building Surveyors for the purpose of education and information. Views expressed by presenters and contributors are not necessarily endorsed by the AIBS. No responsibility is accepted by the AIBS for the accuracy of information presented at such training and conferences, or contained in written material provided to attendees at such training and conferences. The information and material presented is intended as informative only, and should not be relied upon without having first obtained professional advice, and no responsibility is accepted by the AIBS for any liability whatsoever to any person for any act done in reliance, whether partially or wholly, on the information presented or written material provided at any training or conferences. No part of any written material may be reproduced, copied or duplicated without the express written consent of the AIBS and the author. AIBS invites attendees to enjoy Sundowners on Thursday 16 May. The Annual Chapter Dinner will be held on the Friday evening and provides a great opportunity for networking and is a highlight of the QLD/NT Chapter Conference.